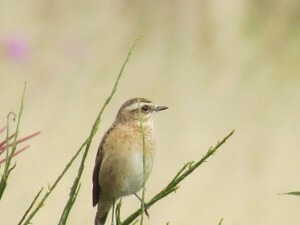 After seeing this pristine-plumaged Whinchat on an unmown strip between blocks of football pitches on Wanstead Flats on Saturday morning (18 April) – and after Nick Croft’s great photos of the bird (which appear with this article) – I was inspired to look back over our spring records. To put things in context, this gorgeous bird winters in sub-Saharan Africa and breeds in uncultivated, often damp, areas in north-west, northern and eastern Europe – though sadly no longer in London, where the last confirmed breeding was at Rainham in 1989. 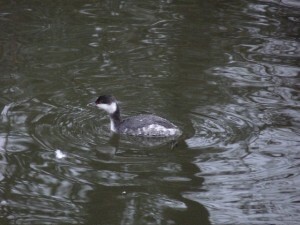 Pairs have certainly summered in that area since then, but for Wanstead its status is of a passage migrant in autumn and to a lesser extent in spring. 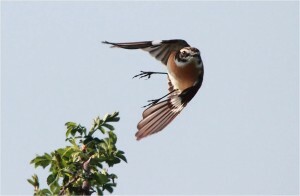 Returning birds are regularly seen in some numbers in late August and September, when Wanstead Flats is one of the best London sites (with a peak count of 13 in 2009). 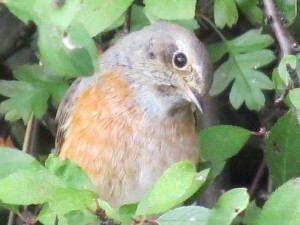 Notably also, autumn birds tend to stick around for a few days. Spring migration is much more of a rush and passage dates are more tightly concentrated. When trawling back through old bird reports I was surprised to find years when no spring birds had been seen at all, though we are hampered by a very incomplete set of local records. 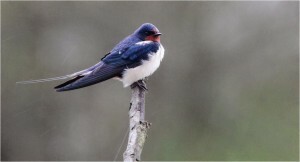 In the years 1976-81, during which there were published records, the only migrant noted in spring was a male on 8 May 1977. The recent picture is healthier, though whether that represents more individuals stopping off here on their way north – or simply much better observer coverage – is impossible to say. 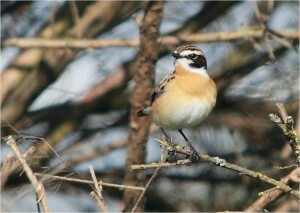 One thing is clear: the male Whinchat found at the western end of the Flats by Dan Hennessey on 16 April is the earliest record we’ve had in the recent sequence of reports, dating back to 2009. Indeed, it could be the earliest record ever. It is also an exception to the rule of thumb that passage locally is pretty much confined to the last week of April and the first week of May. Assuming Dan’s individual and the bird found at the eastern end of the Flats two days later were the same (and they may well not have been), there have been five April birds and eight in May, with the latest being a male near the broom on the Flats on 11 May 2012 and a female in the same area on the same date in 2014. There have been seven males, three females and three unspecified. The best recent springs were 2012 and 2014, with at least three birds each, though there’s still plenty of time for that total to be matched this year! And the best places to look are on and around the broom south of Long Wood, in the SSSI and in the scrubby grassland opposite the Golden Fleece. And here’s to plenty more! After the early promise of Wheatears in mid-March, followed by a handful of Sand Martins and Swallows, and the establishment of territories by Chiffchaffs and then Blackcaps, not much visible bird migration was witnessed in the first few days of April. All that changed on 5th when two Red Kites and six Common Buzzards passed over our area, two more Wheatears appeared on Wanstead Flats and Meadow Pipits continued to trickle north. The trickle became a flood the following day, when 240+ were counted as they flew north. In fact, during the first week of the month alone, more than 420 Meadow Pipits were logged by the Wanstead Birders crew. The 5th also marked the start of a brief Linnet passage, with at least 45 noted moving north. 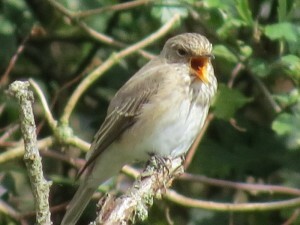 The first Willow Warbler was singing on that date, to be joined by a sprinkling of others in the following week, but doubtless very few will stick around. Fog on 9th forced single Golden Plover and Green Sandpiper to ground on the Flats, and the first Ring Ouzel of spring was found the following day. However, it was still pretty quiet until 13th when the spring’s biggest day count of Swallows (at least 10, not actually very many!) and another Wheatear were good, a Sedge Warbler at Alex was better and at least three Ring Ouzels (including two bright males, sharing their time between the SSSI and Long Wood) were the pick of the crop. The ‘mountain blackbirds’ delighted plenty of visitors by staying well into the evening. 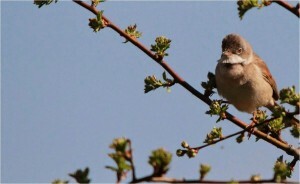 The following morning Bob found the season’s first Common Whitethroat in the brooms. A short while later, Barry discovered a Red-legged Partridge in the same vicinity, and while I was doing some breeding bird survey work in the Old Sewage Works I heard the unmistakable sound of a reeling Grasshopper Warbler, the first spring record for our area. Later in the morning, three Tree Pipits were seen there and Dan found a male Common Redstart near Davis Lane School in the afternoon. Add to that list a sprinkling of Swallows and you have the recipe for a very good day. Let’s hope there’s plenty more to come. Wanstead Flats was at its very best for early autumn migrant birds on Sunday morning, 31st August, with a lovely selection of chats, warblers and flycatchers, and a few Swallows passing through. The good thing about the Flats is that the area holds birds … there is plenty of food and cover for them. Minimum counts this morning from the Wanstead Birders team included 10 Swallows flying through, a Tree Pipit, 10 Northern Wheatears, 11 Whinchats, 7 Common Redstarts and 14 Spotted Flycatchers. 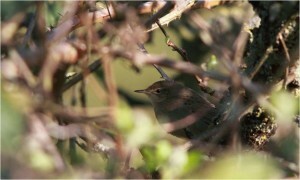 Plus plenty of Common Whitethroats, Blackcaps, Chiffchaffs and Willow Warblers. All in glorious sunshine! Whilst walking along the east end of Perch Pond on 7th August, I stopped to investigate both the plants along the pond’s bank, and to watch the various dragonflies and damselflies flying along there. There were several of the various ‘blue’ damselflies, a Brown Hawker, a female Emperor Dragonfly (egg-laying), but the only one I managed to photograph was a red darter. Closer examination showed it to be a Ruddy Darter, which is less abundant than the similar looking Common Darter. The most obvious distinctions are that the Ruddy Darter’s waisted abdomen is more of a blood-red colour, whilst the Common Darter’s is a slightly paler orange-red, and is not a waisted shape, ie it is more straight. Also the RD’s head is red, whilst the CD’s is brown; and the RD’s legs are black, whilst the CD’s are brown. There are a few more ID distinctions, but to see them you would either have to look more closely at the creature – perhaps via binoculars – to observe its different markings, or study any photographs which you have taken later, and check them with a field-guide. 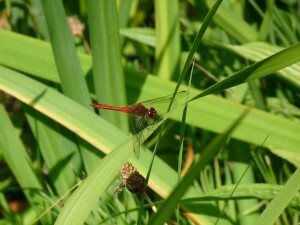 Two days later I found another Ruddy Darter, this time on Shoulder of Mutton Pond. A Black-tailed Skimmer and an Emperor were both ‘patrolling’ there, and there were several of the ‘blue’ damselflies. Some of the blue damselflies looked decidedly shorter – and they turned out to be Small Red-eyed Damselflies, a fairly recent colonist in the UK.